Chocolate! One of life’s, well, maybe-not-so-guilty pleasures. I admit that despite having the “RD” credential after my name, I indulge in a chocolatey treat at least once or twice a week. If you follow our blog, you’ll know that there are no forbidden foods here. Of course like any sweet, chocolate should be consumed in moderation. You don’t want to run out to have a pound of chocolate every day. Although, I know, sometimes that may seem like a good idea! At least to your taste buds. After seeing that chocolate came at #6 in Julie’s “Worst Foods for Your Diet” article yesterday, I felt compelled to plead a case on behalf of this once-in-awhile treat. One of my favorite things about being a registered dietitian is looking at credible nutrition science to separate fact from myth. In my experience, many people have banned food from their diets unnecessarily because they heard misinformation somewhere that led them to eliminate something from their diet. Today I’ll bust some common myths about chocolate so that you can feel better about giving in to your chocolate cravings (in moderation) from time to time. It may sound like wishful thinking, but chocolate, mainly dark chocolate, can be good for you. Dark chocolate and cocoa contain cell-protecting flavanol antioxidant compounds. Two tablespoons of natural cocoa have more antioxidant capacity than 3 ½ cups of green tea, ¾ cup of blueberries and 1 1/3 glasses of red wine. While a small amount of any type of chocolate is fine for occasional consumption, the darker the chocolate, the more healthful impact. This is due to the fact that the cocoa powder in chocolate is the most concentrated source of cocoa flavanol antioxidants. Consider this: antioxidants known as polpyphenols make up more than 10 percent of the weight of dry raw cocoa beans. MYTH: 1. Chocolate is loaded with cholesterol-raising fat. FACT: Cocoa butter, the fat in chocolate, might be expected to increase blood cholesterol levels because it contains saturated fat. But stearic acid, the main saturated fat found in milk chocolate, is unique. Research has shown that it doesn’t raise cholesterol levels the same way that other types of saturated fats do. When consumed in moderation as part of a balanced eating plan, chocolate does not increase blood cholesterol levels. In fact, eating a 1.4 ounce milk chocolate bar instead of a carbohydrate-rich snack was shown to increase HDL (good) cholesterol levels. MYTH: 2. Chocolate causes weight gain. FACT: Chocolate can be a part of an overall healthy lifestyle when consumed in moderation. The key to managing weight is balancing the calories consumed each day with the amount of energy expended from physical activity. An average chocolate bar contains about 200-220 calories, which is low enough to be included in a weight control diet if substituted for other high-calorie foods. If you keep your portion sizes small, the occasional treat can be a guilt-free part of your diet. What’s more, many favorite candy and chocolate bars are also available in snack sizes, which often have less than 100 calories per piece. In addition, experts believe that saying no to favorite foods is not the answer. Enjoying an occasional piece of chocolate actually may help you stick to a healthy eating plan. One tip is to truly savor a small piece of chocolate by letting it begin to melt in your mouth and eating it slowly, noting the luscious flavors. MYTH: 3. Chocolate is high in caffeine. FACT: Many people are surprised to learn that a typical serving of milk chocolate contains relatively small amounts of caffeine – slightly more than an 8-oz cup of decaffeinated coffee. 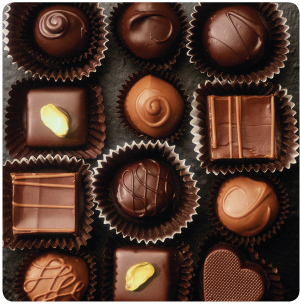 Dark chocolates contain more caffeine; caffeine content can range from about 25 to 40 mg per serving. A typical 8-ounce cup of regular coffee contains 65-120 mg of caffeine. Both milk and dark chocolate also naturally contain theobromine, a close relative to caffeine. Amounts range from about 60 mg in a 1.4-ounce milk chocolate bar to over 300 mg in an 82% cacao dark chocolate. Although in the same family of compounds as caffeine, theobromine has been found to have different effects in the body. It is believed that theobromine, unlike caffeine, does not have much, if any, stimulant effect. MYTH: 4. Chocolate lacks any nutritional value. FACT: Chocolate and cocoa contain flavanols – antioxidant compounds also found in tea and red wine. These compounds have been associated with supporting heart health. A typical dark chocolate bar contains as much antioxidant capacity as 2 3/4 cups of green tea, 1 glass of red wine, or 2/3 cup of blueberries. In addition, chocolate also contains minerals and dietary fiber. MYTH: 5. Dutching destroys all the flavanol antioxidants. FACT: Dutching, or processing with alkali, breaks down the flavanol antioxidants naturally found in cocoa and chocolate. However, the extent to which the flavanols are lost is related to how heavily the cocoa or chocolate is dutched. In the U.S., dutched cocoa can be identified on the ingredient panel of a food when labeled as “cocoa processed with alkali.” Unfortunately, food labels do not allow a consumer to determine the extent of alkalization of a cocoa powder, so for the most flavanol antioxidants, choose a natural cocoa. MYTH: 6. Chocolate must contain at least 70% cacao to be good for you. FACT: In general, the percent cacao can be an indicator of the flavanol content of a chocolate – i.e., a 70% cacao chocolate will typically contain more flavanols than a 50% cacao chocolate. However, there is nothing magical about a 70% cacao chocolate. In an 18-week study, individuals who consumed a small amount of 50% cacao chocolate experienced a significant reduction in systolic and diastolic blood pressure. A recent study showed short-term improvements in blood flow and blood pressure after consumption of a 60% cacao dark chocolate. MYTH: 7. Chocolate causes acne. FACT: Studies going as far back as the 1960s have failed to show any relationship between chocolate consumption and acne. An extensive review in the Journal of the American Medical Association (Minkin W, et al., 1970) concluded that “diet plays no role in acne treatment in most patients…even large amounts of chocolate have not clinically exacerbated acne.” Preliminary research has actually demonstrated a beneficial impact of cocoa on skin health, measured as improved photo protection and dermal blood circulation, measures of the health of the skin surface and skin hydration. The Bottom Line: True — chocolate is high in fat and calories. But eaten in moderation, chocolate can be a part healthy, balanced diet. Steinberg FM, Bearden MM, Keen CL. Cocoa and chocolate flavonoids: implications for cardiovascular health. J Am Diet Assoc 2003;103:215-23.